Do remember a time when you resisted change? What was the reason? Today you are the leader of change and you are on the other side of it. How do you feel about resistance now? Too many leaders forget those times when they were at the opposite end of change. But now you are leading a major transformation and your view is different. Despite what popular surveys may indicate, employees want leadership. Especially in times of transformation. Just as the CXO is responsible for the financial success of a company, so too is he/she responsible for the “people” success of the company. According to Prosci®, the world leader in Organizational Change Management Training, visible and active sponsorship is the number one factor in successful change. At the end of the day, the success or failure of any company-wide change effort starts with you, and it is your responsibility to lead others to work through resistance. First, let’s look at this term “resistance.” It sounds like something to be combated or suppressed. This not our favorite term, but it is fairly standard for Organizational Change Management. What we want to consider is that people may not always start with a positive view of any company change, and we know at the start that it will impact them. With this view in mind, “resistance” can range from people who are unaware of the change, or the benefits of it, to people who are passively or actively against the change, to those who are sabotaging it. At whatever level, the leadership team needs to have a plan for working through potential and active resistance. At MSS we advise our clients to consider their methods for working through resistance in advance. Change management done by the seat of one’s pants has as much chance for success as launching a new product without researching its potential success in the marketplace ahead of time. At MSS, we see three major steps leaders can take. Resistance to change is a natural reaction for many people. For better or worse, they are comfortable in their current state. 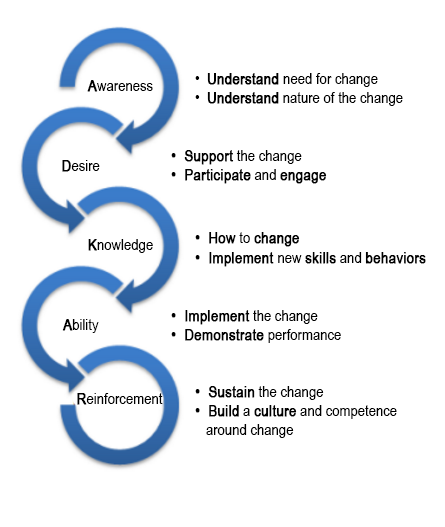 Get ahead of the coming challenges by recognizing not only that Organizational Change Management is required to be successful; but that understanding the potential impacts and creating mitigation strategies provides you with a much-needed starting point for managing the change going forward. By implementing change management and anticipating potential challenges you are likely to mitigate most of it before you even get started. Don’t wait for resistance. Thinking about people or groups who may be resistant can go a long way. If their way of managing things is going to change significantly or if their role will change, one can understand that they may be resistant at first. By identifying these groups in advance you can include them in the process, help identify benefits to them, gain feedback and make necessary adaptations where sensible. Often, resistance comes from a lack of awareness and knowledge about the change. By working with individuals and groups utilizing the Prosci ADKAR Model, you can bring them along before emotions take over and resistance builds. Compensate – this is not endorsing bribery but sometimes the change may be affecting them through longer hours, a change in a benefit to them, or just a requirement for them to change their skills. This could be worth a change in compensation either one time or long term. Number 6 is often the hardest to swallow, but there are examples where it is applicable. I knew an executive who was resisting a change in organizational structure that seemed to benefit him. He was traveling all the time and never home. The structural change would allow him to be home more and for longer periods. But there was an impact no one considered. The number of miles points this person was earning was huge, and he had status on every major airline and hotel group. All of this would be diminished. To this person, this was worth about $20k in compensation as it paid for a nice vacation for his family often on the heels of a business trip to an interesting location. He saw this as a reduction in his compensation. With a supplement to their income and more vacation time, the issue was fairly solved. Despite anyone’s best efforts, there will always be those who continue to resist. These individuals can be at any level in the company, and can carry a good deal of persuasive weight against you achieving your transformation goals. Regardless, when resistance cannot be overcome through the methods described above, a more personal approach may be needed. Here is where the “Plus” can be employed. Many have described going through a business transformation as a form of grieving. “Out with the old and in with the new” no longer will suffice when transforming your business results in changes in the way your employees work, which is almost always the case. Many years ago, Elisabeth Kubler-Ross identified five stages of grieving in her book On Death and Dying. That was 1969, and in the many years since, her work has been referenced across many disciplines. 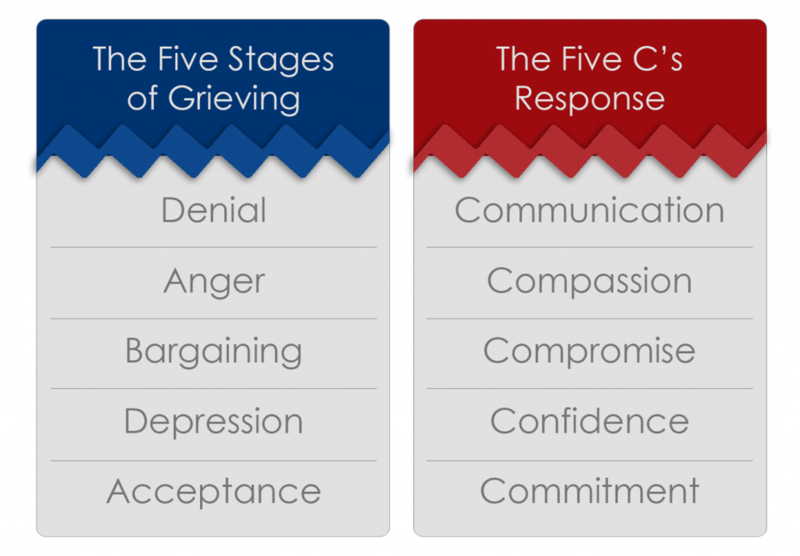 If we believe that going through a business transformation results in the need for organizational change management to effectively mitigate the resistance that occurs, then the five stages of grieving can be an indicator of where that resistance is most strong. But being able to identify the resistance in this way isn’t enough. There must be a response to or with each stage that facilitates the transition from resistance to supportive action. Going through every stage, in order, is not the objective in using the Five C’s. Being able to isolate the reason for one’s resistance, and providing an accepted response achieves the desired outcome of mitigated resistance. Hence, the Five C’s. Employing the Five C’s requires trust on the part of the person resisting, and a genuine desire to help someone through their resistance. Many of us feel that we don’t have time to put into the personal way of combatting resistance, but the benefits can be huge. Consider the following example from my own experience: I was managing a major business transformation from an antiquated financial system and set of processes, to a state-of-the-art ERP solution (both process and technology). This program involved every team in the company, and included a major restructuring of both the Finance and Operations teams to be successful. One of the key cost savings was to come from eliminating manual processes in the Accounts Payable department, which would result in some potential job loss for the AP team. The AP Manager was very supportive of the program, on paper. But when it came to implementing the changes in her department, she balked. We had very skilled OCM consultants working with us and they were able to mitigate a number of concerns that people across the company had. But with this manager, the resistance remained. The time for the transition was fast approaching and without her visible and active support, we would lose achieving some of our benefits. So, one day, I pulled her into the conference room near our offices. I started out by validating her understanding of the transition in front of us. The Communication efforts had been successful, she clearly was not in Denial. As we started to discuss the future state of her department, she became visibly irritated. Her voice began to rise a bit, and she began talking about how it should have been up to her to decide the benefits in her department, and she felt that she had been put in a very bad situation with her team by having to eliminate a few positions going forward. I listened. I told her that I understood. And I mean it. I showed Compassion in the face of her Anger. That seemed to be the watershed moment when she then began to bargain with me about those changes she had to make. In the face of that, I offered her Compromise. “Perhaps,” I said, “we can delay taking any steps to change your department until we are fully transitioned to the new processes and system.” This was an acceptable compromise, and we ended the meeting with her commitment to be the change agent we needed for the remainder of the program. In the end, success or failure starts and sometimes ends with the leader of the change. By following this approach or one like it, you can be in a much better position to work through the natural resistance that comes with change and increase your likelihood of complete success. As we pointed out in a recent article 10 Ways Leaders Can Sabotage Their Own Transformation Programs, “there are several ways that leaders encumber change”. Don’t be that kind of leader. Embrace your role as the leader of the change, and take advantage of the many ways resistance can be overcome.